KK: What is your assessment of 2018? PM: The year 2018 is a year where we had a chance, an opportunity as a country to make things right, beginning with elections and a chance to sort out our politics as a nation. Unfortunately, we let that chance slip. We were supposed to make sure that as a nation we would not have disputed elections. We were supposed to make sure that after (former president Robert) Mugabe has gone, we will rebuild and reform our institutions and ensure that they are independent. We were supposed to ensure that there would be separation of power within the branches of state. We were also supposed to bring people together, come up with a national vision and build national cohesion to get us out of the economic, political and social crisis that we have been in for the last 20 years. Unfortunately, the government failed to harness both the approval of the international community and the approval of citizens and we are back to where we were. That is a state in crisis characterised by disputed electoral results and a debilitating economic crisis. We as labour can safely say that the year 2018 was a missed opportunity. We have also witnessed suffering and hardships among the citizens starting with the disruptive 2% tax imposed by government on the economy. Workers have lost all their savings and pensions and they have also lost value of their salaries and the general citizenry have been dispossessed of their livelihood. This is evident in the informal sector where there are in running battles with the police and local authorities. If nothing is done, many families are going to face serious social challenges. KK: What is your view of the 2019 budget? PM: For starters, the current government has not taken time to bring people together to discuss the direction the country should take. They have unilaterally come up with their own vision and come up with the mantra “Zimbabwe is open for business”. They have now couched another mantra called “austerity for prosperity”. Without looking at the budget, there is a disjoinment between state and the citizens. The citizens have not been effectively allowed to bring in their input. The government has disregarded the input of its citizens in terms of its policy strategy. We have a new minister who came up and, immediately without consulting any stakeholders, produced the Transitional Stabilisation Programme. Government came up with the vision for the country to be an upper middle-income economy by 2030 without consulting anyone. Government is going it alone. It is not carrying anyone on board. The budget was anti-poor, anti-workers and will not address the real challenges the citizens are facing which include unemployment, poverty and inequality. Overall, it is not a budget that addresses the needs of the poor man and the ordinary citizens. As long as the budget failed to address the issue of currency and exchange rate distortions, the country will not succeed. The failure to address distortions is going to create winners and losers and the majority of the workers and the poor are going to be the losers. The US dollar is now being used as the unit of account, but workers do not earn in US dollars. We also expected a budget that would bring about inclusivity. Of course, it is talking about shared growth but there is nothing tangible that is supporting the shared growth. We are expecting to see many workers in the public sector losing jobs. Although we support the cleaning up of the public sector in terms of removing ghost workers and political appointees who are doing nothing, we need to be mindful that we have few teachers and doctors compared to what we must have. Government is driving free market economics. Free market economics have failed everywhere and the world is currently in crisis because of free market economics. The government wants to please a few elites at the expense of the majority and it is the majority that must carry the burden. The policy thrust which has informed the budget is very wrong for the economic recovery of Zimbabwe. KK: Given your description of the budget, how does it amplify your call for workers to be paid in foreign currency? PM: When we made the call for workers to be paid in forex, we experienced many challenges. But now service providers are demanding forex and the government itself is demanding forex. The minister has said (import) duty should be paid in forex. The Zimbabwe Revenue Authority is also demanding to be paid in forex. If everyone is demanding to be paid in forex, it becomes logical that workers in these companies must be paid in forex. If you also look at the distortion, we are purchasing in shops whose prices are pegged in US dollar. The US dollar is basically is 1:3 with the bond note at the parallel market. 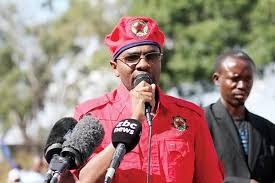 If workers are to continue to earn in RTGS, it means their salaries have been devalued seriously. We are now earning less than a third of our bargained salary. There is no alternative in our view as long as supermarkets, service providers and government itself now want forex. Workers must earn in foreign currency. KK: How important is it to legislate the Tripartite Negotiating Forum? PM: Legislating the TNF has been an important aspect since 2001. We came up with this after realising that the country is in a crisis. We have been in a crisis for almost two decades now and the legislation of the TNF has been on the agenda for nearly two decades. The legislation of the TNF has been on the agenda in the last three Parliamentary sessions. This simply shows there is lack of political will on the part of government. Government does not want to involve citizens and it does not want to involve labour in discussing policy formulation and discussing economic policy development. The only way to come out of our current crisis is through social dialogue and coming up with a social contract. Legislation of the TNF has never been more important as currently. It is still a very important aspect but it seems the government does not want to involve anyone in policy formulation. KK: Looking at the issue of retrenchments, how widespread were they in 2018? PM: I am yet to get the actual figures but, given anecdotal information, it goes without say that companies are struggling and there have been retrenchments across various sectors and now with the 2% tax, the havoc that it caused in the economy we know the companies have been strained, especially after the government failed to address the issue of currency distortions. This will lead to more retrenchments and companies folding. KK: How effective are demonstrations that you call for from time to time as a tool of protest? PM: We think they are effective, basing on the response of the authorities. I think for sometime we had not seen the heavy handedness of the police when we called for demonstrations. When the demonstrations were supported by the citizens, the police came out in full force, in full armour and blocked us from demonstrating. From that aspect, we think they are very effective because we demonstrate to send a message to the state. So if the state comes down heavily on you it means you have sent the message eloquently and effectively. It shows that the dictatorship does not want to deal with the message but deal with the messenger. It is a constitutional provision. It is not put there for design, it is there as an effective means for communicating, lobbying and advocacy. Unfortunately we have a leadership that does not respect the constitution. We will continue with demonstrations because they are an effective tool of communication and it is a constitutional provision. KK: What is your view of the National Health Scheme being proposed by government and has been on the cards? PM: It will never take off because government is not serious about policy implementation. A national health scheme is a good idea as long as you address the macro-economic fundamentals. You cannot have a national health scheme when only 5% of the country in the formal economy and expect them to fund the whole population. The math does not add up. The economic fundamentals must be addressed first before we can experiment with the national health scheme. KK: You were a board member of the National Social Security Authority, what is your view of the entity? PM: Nssa is a mirror reflection of the nation. If the government is corrupt and does not follow due process it also affects Nssa. Nssa has been abused for a long time and, when I entered Nssa and tried to address these issues and reform it from within, I was dismissed and had to fight to be reinstated.